I've been trying to save some money recently so I've not been hitting the shops as frequently as I'd like. However, last weekend I was shopping with a girl friend and spotted this little beauty at Accessorize. It didn't break the bank at £3 and I've worn it twice so far without it breaking itself. 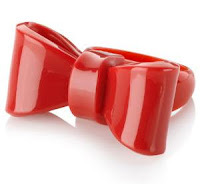 There's also a black version which they call the 'Mega Bow' and for good reason. I tried it on and it pretty much covered three of my fingers! wow I really want one now!! you can save the rest, but this ring deserved to go home with you.